Since Scrapbooking exploded in popularity, the stamp options seem endless and how you choose to use them is only limited to imagination. 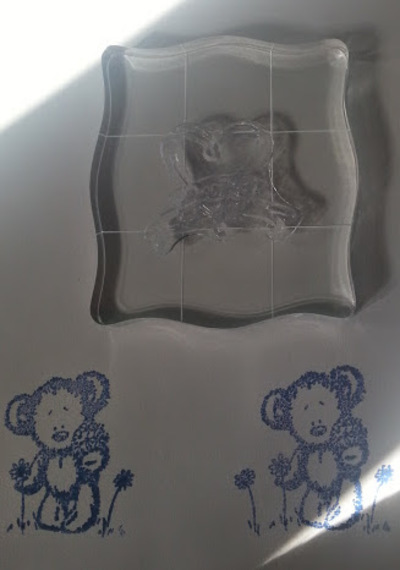 I decided to take some of my clear stamps and create a fun project in my Visual Art Diary to give you more simple ideas to create images. 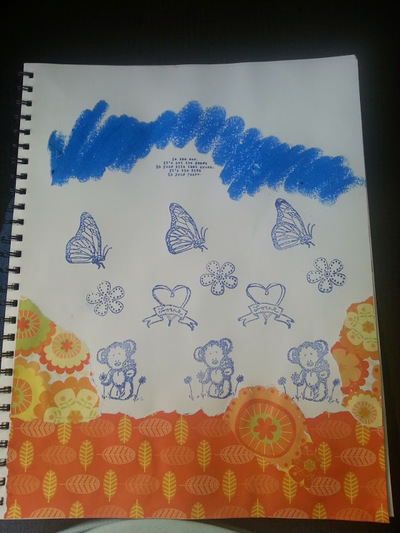 Place your stamps on the acrylic base and pat the ink pad and begin to place the images down on the art diary page in a pattern that appeals to you. 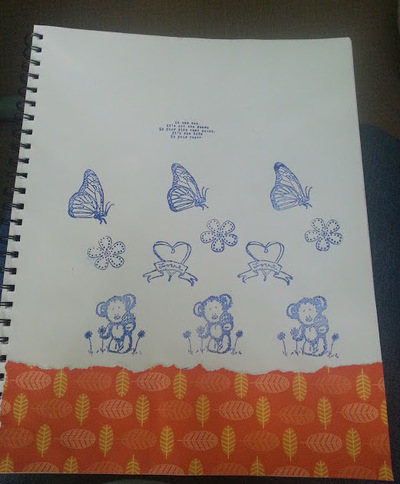 I have used a mixture of stamps. 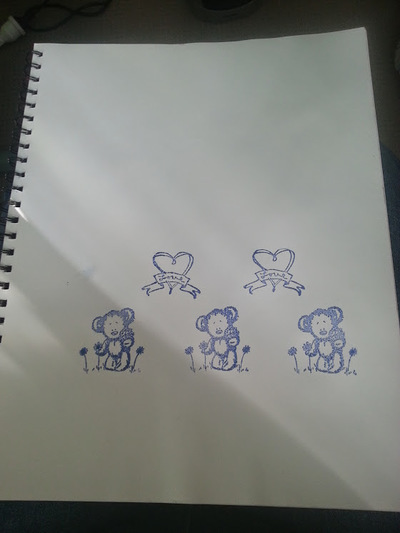 I use the baby wipe to remove any excess ink from the stamp before applying them to the paper. 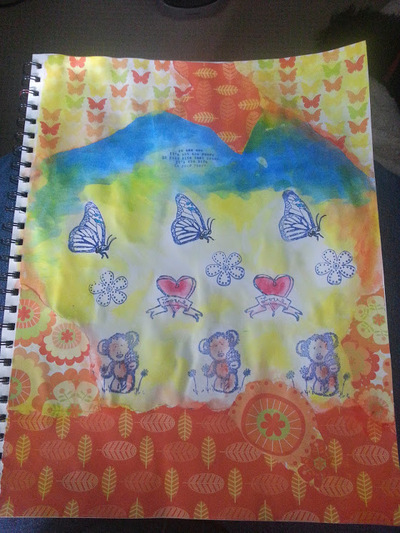 A teddy bear picking flowers, hearts with a 'love' banner, a butterfly and another flower to help tie the images together. I also used a text stamp at the top to give contrast. 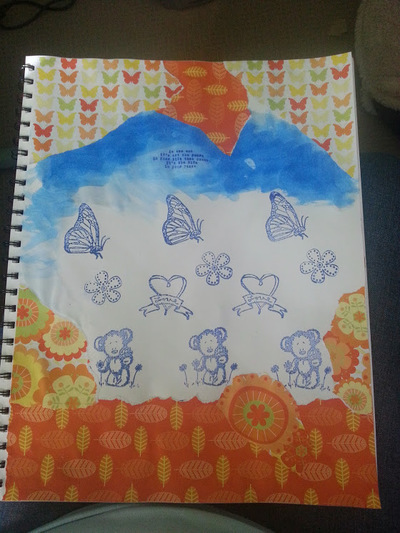 Tear up the pattern paper and begin to design a boarder around your feature image. 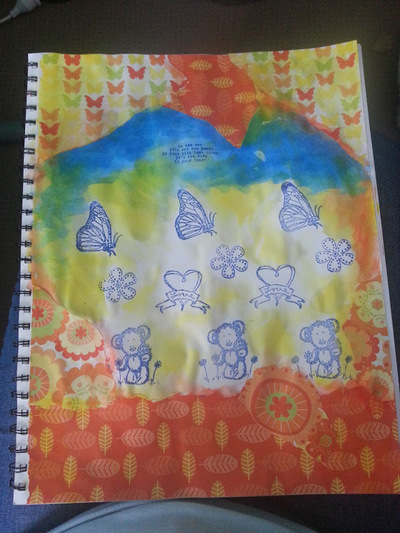 Glue paper to the edges and have lots of fun. Add colour. I used Pastel Gliders to block in colour and then took my paintbrush with a little water to create a watercolour/painterly effect. You can use water colours if you prefer. Then I continued to had the borders and blend the colours into the frame. Continue to layer colours into the feature are of the artwork and blend with the boarders. I was careful to leave the stamped images as white as possible. I wanted to spend time making them 'pop' off the page with pen and watercolours. Take your coloured pens or a black fine-line marker pen and begin to trace the stamps to make them 'pop' out of the artwork. 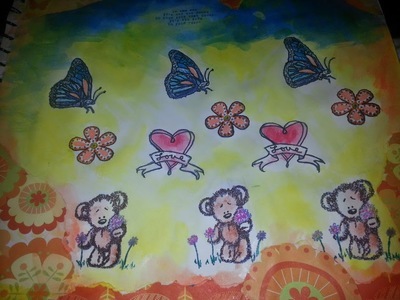 I used a mixture of watercolour, pastel gliders with water and coloured felt-tip pens with a black fine-line marker to shade the stamped images and bring them to life on the page. When you do this, you give the artwork a life of it's own and have a lot of fun seeing the whole image come together. 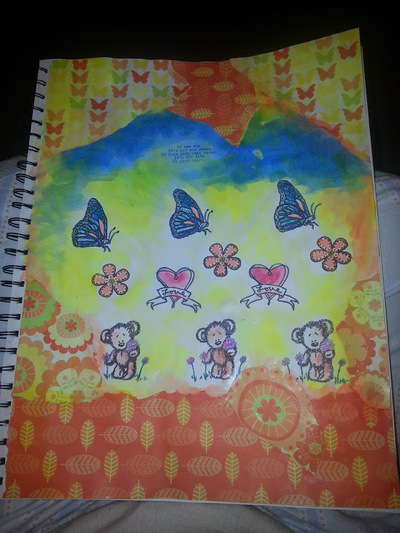 Keeping a Visual Diary is a great way for you to explore your subject matter, different techniques and media. It also becomes a living representation of your relationship with image.